Are you performing rotator cuff exercises? Strengthening the rotator cuff muscles (subscapularis, supraspinatus, infraspinatus, and teres minor) is critical from preventing injury to performing at your best during sports that involve movements such as serving a tennis ball, throwing a baseball and a popular exercise such as bench pressing just to mentioned a few. As important as these exercises are, many people who exercise may skip them altogether. Don’t make the same mistake. 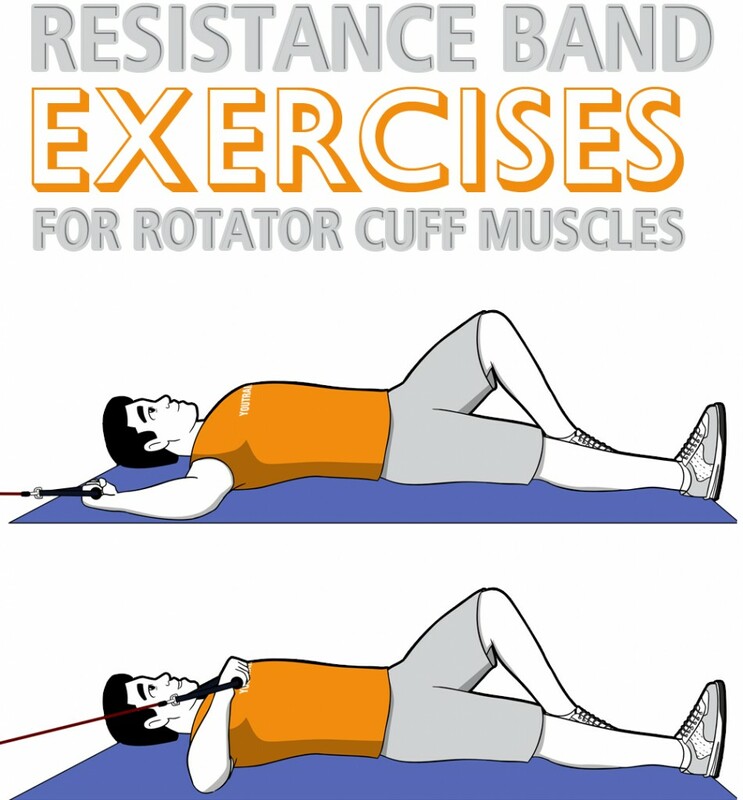 Our recommendation is for you to perform these rotator cuff exercises at least once or twice a week with our premium quality resistance bands; they are made of the highest quality dipped Malaysian Latex. 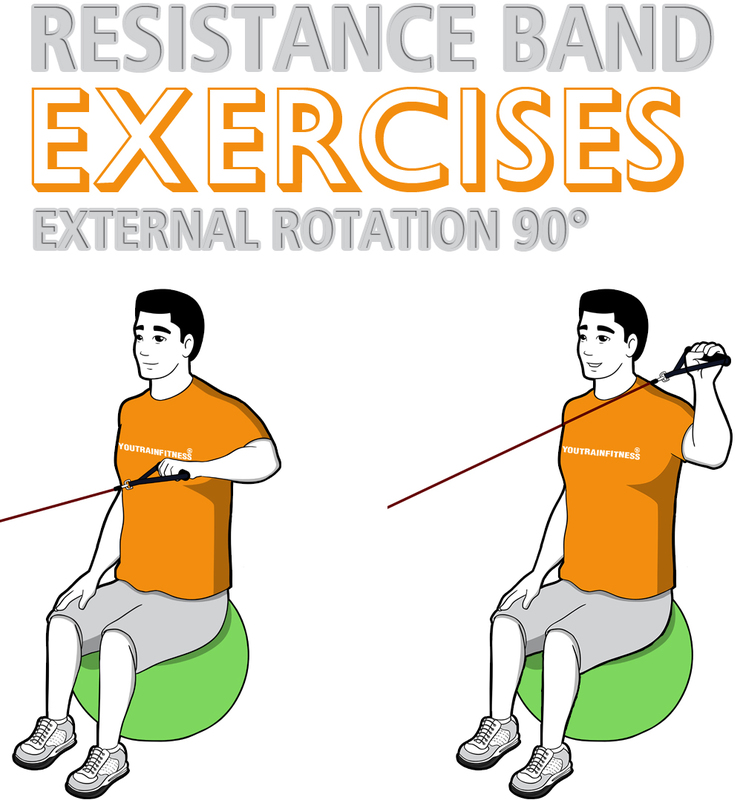 The term resistance band may be used to mean resistance tube. See explanation here. Use coupon code “10%NOW” to receive ten percent on your first purchase today. Begin with the standing internal and external rotation exercise for both arms then continue to the floor or a raised table for the supine resisted internal rotation. As you become stronger practice the stability ball shoulder external rotation at 90° abduction and stability ball Shoulder internal rotation at 90° abduction. Consulting your health care provider is suggested before performing these exercises so that s/he can evaluate if these exercises are right for you. When using resistance bands the handles may slip from your hands if you are not holding them carefully or the tube can break. We recommend that you wear safety goggles to protect the eye from injury. 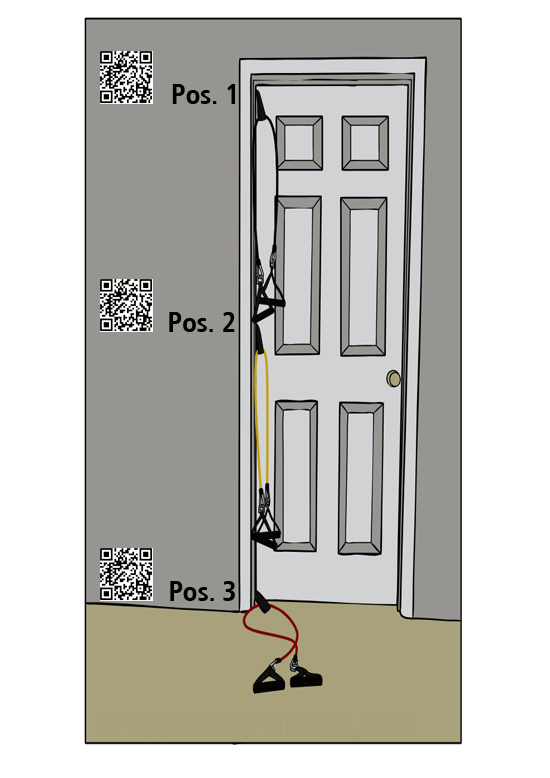 Attach the resistance band around a stable object slightly above the waist or attach it to our resistance band door anchor (towards the center on the hinge side of the door) [Pos. 2]. 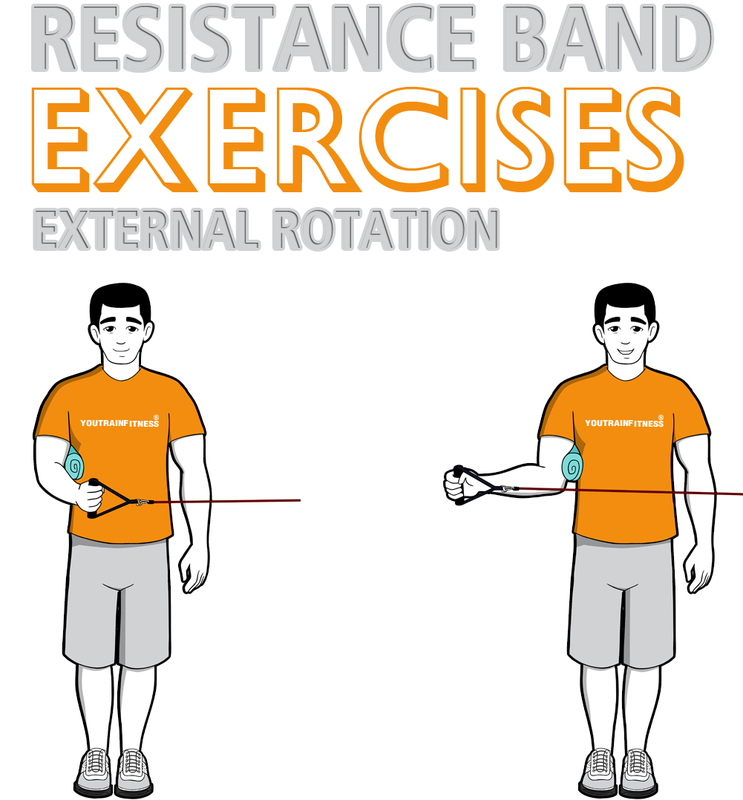 Grab the handle of the resistance band with the hand that is farther away from the door or anchor point and place a towel underneath that arm as shown above. Engage the core, and slowly rotate the shoulder externally (away from the body) while keeping the arm close to your side, parallel to the floor and wrist straight. Pause for 1 second at the end of the range of movement, then slowly return the handle to the starting position. Repeat for 8-12 or 12-15 times then perform the movement for the other side. Attach the resistance band around a stable object slightly above the waist or attach it to our resistance band door anchor (towards the center on the hinge side of the door) [Pos. 2]. 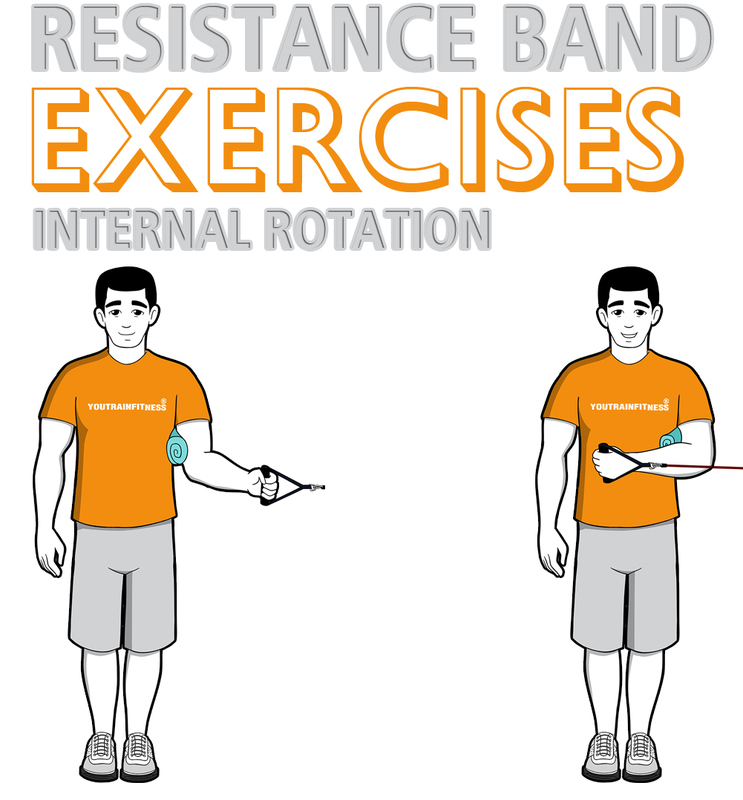 Grab the handle of the resistance band with the hand that is closest to the door or anchor point and place a towel underneath that arm as shown above. Engage the core and slowly rotate the shoulder internally (towards the body) while keeping the arm close to your side, parallel to the floor and wrist straight. Pause for 1 second at the end of the range of movement and slowly return the handle to the starting position. Repeat for 8-12 or 12-15 times then perform the movement for the other side. Lay on your back and grab the handle of a resistance band securely with one hand while extending the elastic tube under the bottom of the foot with the other hand. Upon grabbing the other handle, position your arm at shoulder level so that the elbow is bent at 90 degrees with wrist straight. Lower the handle towards the head while keeping the arm fixed at a 90 degree angle. Pause and slowly return the arm to the start position as shown above. Repeat for 8-12 or 12-15 times then perform the movement for the other side. Attach the resistance band around a stable object above the head or attach it to our resistance band door anchor (towards the bottom of the hinge side of the door) [Pos. 3]. 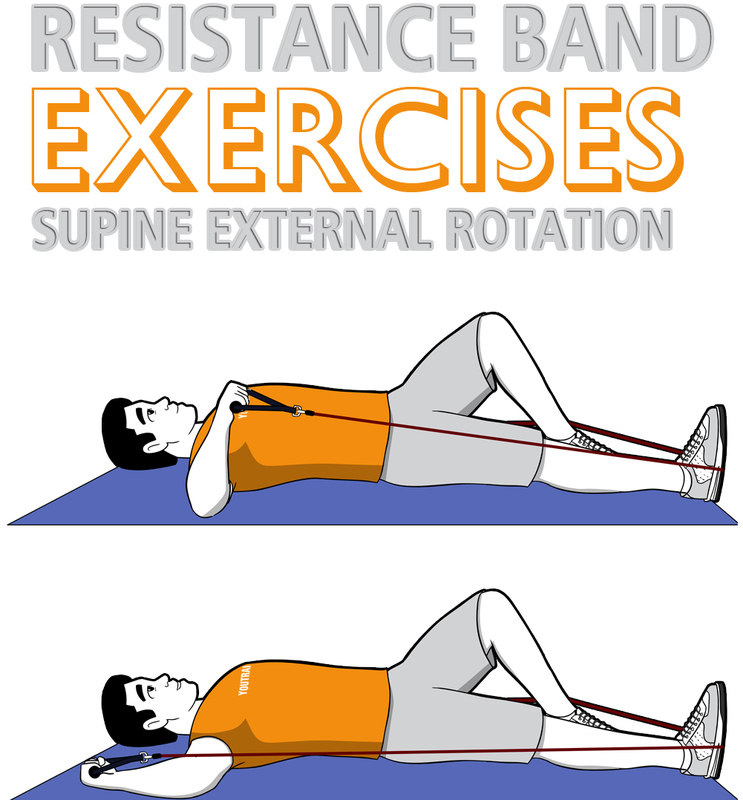 Lay on your back and grab the handle of a resistance band securely with elbow bent and back of hand resting on the mat. Rotate at the shoulder and bring arm up to shoulder level, bent at 90 degrees with wrist straight. Pause and slowly lower the handle back towards the head while keeping the arm fixed at a 90 degree angle. Repeat for 8-12 or 12-15 times then perform the movement for the other side. Attach the resistance band around a stable object in front of you or attach it to our resistance band door anchor (towards the shoulder level on the hinge side of the door) below [Pos. 2]. Sit on a stability ball, engage the core and start the movement with your elbow at 90 degrees and bent to chest level. Externally rotate the shoulder with elbow bent at 90 degrees and bring the arm up. Pause and slowly return your arm to the start position. Repeat for 8-12 or 12-15 times then perform the movement for the other side. Attach the resistance band around a stable object in front of you or attach it to our resistance band door anchor (towards the shoulder level on the hinge side of the door) below [Pos. 2]. 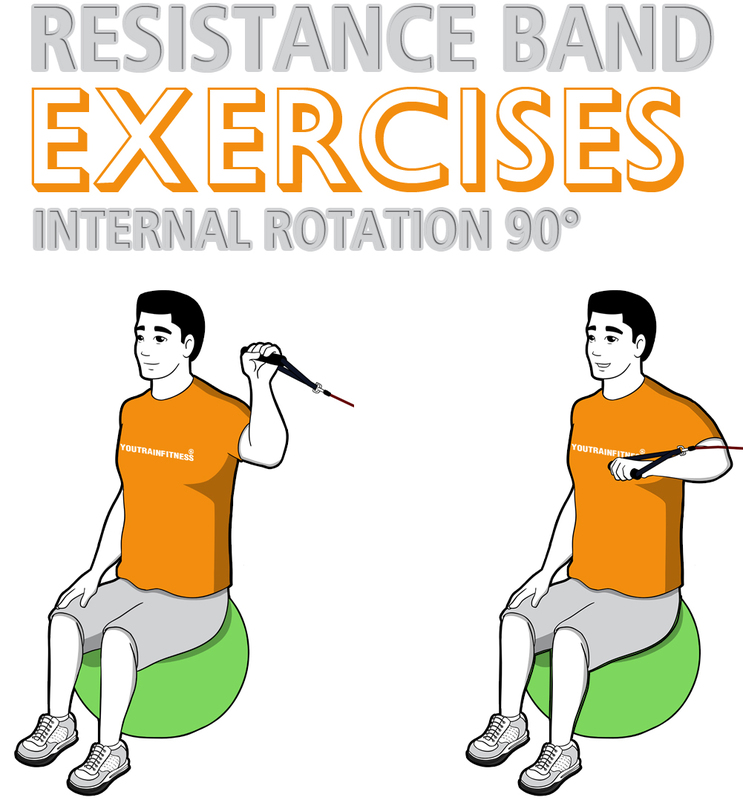 Sit on a stability ball with back to door (or stand) and grab the handle of a resistance tube securely with elbow bent at 90 degrees. Engage core and lower handle while your elbow remains at 90 degrees and bent to chest level. Pause and slowly return your arm to the start position. Repeat for 8-12 or 12-15 times then perform the movement for the other side. The resistance band tension used above is here . However, to ensure that you are using the proper tension level for your ability and to perform other resistance band exercises on our site , we recommend the best deal of purchasing the 12 piece resistance band set. Pick one up today! This entry was posted in How to Guide and tagged Injury, Shoulder Stability.